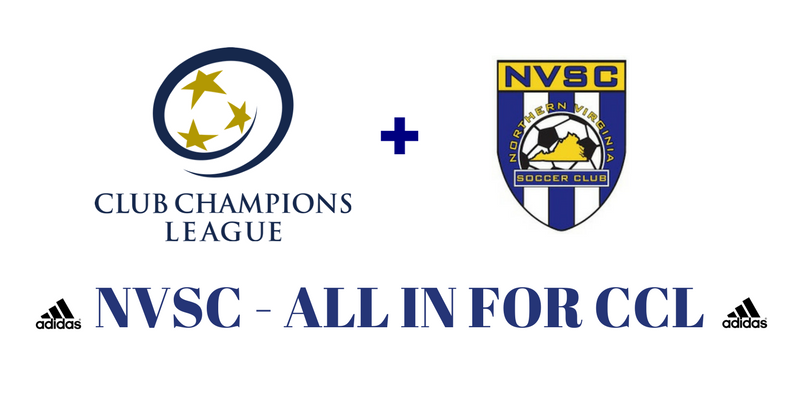 Charlottesville, VA (March 23, 2017) – The Club Champions League (CCL) is pleased to announce that the Northern Virginia Soccer Club (NVSC) will join CCL and all levels of CCL programming beginning Fall 2017. “NVSC not only recognizes the CCL as the best competitive league in the region but also values the club benefits that come with being a member of the CCL,” commented Danny Beamer, CCL President. NVSC joins Ellicott City Soccer Club as the newest members of the CCL. Located in Prince William County, the third largest county in Virginia, NVSC will offer top players looking for a complete player development pathway the opportunity to play in the best regional league in the United States. “NVSC is truly excited about joining a league as prestigious and elite as the CCL. The CCL is a very forward-thinking league that will offer our players enhanced opportunities for development to reach the next level in their playing career. The club-building, player development focus of the CCL is consistent with the NVSC club philosophy. Joining the CCL will open up significant, highly competitive soccer avenues for the players and families in Prince William County from Showcase events to College Combines. Over the next few years, as a member of the CCL, NVSC looks to leverage the resources provided by the CCL to build on the club-centric model, and bolster our programs offerings to enhance our players' long term development,” stated William Gregory, NVSC President. NVSC will play in the coveted CCL club-to-club matchday format for boys and girls age groups 11-19, as well as enter CCL II for age groups 11-16s, and the 9-10 boys and girls developmental divisions for CCL and CCL II. NVSC will also begin preparations to form CCL PRO 23 Men’s and Women’s teams for Summer 2018. Families of NVSC in the 9-10 age groups will also participate in the league’s two free CCL ScrimmageFests powered by SKLZ. “NVSC is ready to fully integrate itself into the culture of the CCL for the fall of 2017. With the news fast spreading to the NVSC community, players are reaching out to their friends with excitement about competing against top talent. With the addition of CCL PRO 23 , NVSC technical staff now has a complete pathway for all players present and past to develop and pursue a higher level,” commented Hans Etienne, NVSC Technical Director. The CCL is based on the philosophy that the player is a member of the club as well as a member of the team and that successful clubs develop players and teams from within. “Commitment to club is important. The CCL and NVSC value long term player, coach, team and club development. We recognize that player development is a journey and not a race. With the majority of players in our region going to colleges and universities within the state and region, the platform that the CCL offers is the perfect developmental springboard to those opportunities,” stated Brian Kuk, CCL Executive Director.